Diamond, Handbook of Imaging Materials, 2nd ed. Handbook of Imaging Materials, 2nd ed. A. Diamond & D. Weiss, eds. This revised and expanded reference presents the most recent developments in the materials, properties, and performance characteristics of photographic, electrophotographic, electrostatic, diazo, and ink jet imaging processesproviding current techniques and modern applications for ink jet, thermal, and toner-related imaging systems. 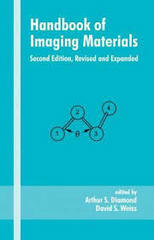 Written by recognized authorities in the field, the Second Edition of the Handbook of Imaging Materials is a state-of-the-art source for optical, electrical, mechanical, and chemical engineers, physicists, chemists, biochemists, materials and imaging scientists, and upper-level undergraduate and graduate students in these disciplines.